Senile purpura is a condition that impacts the elderly and is referred to in many different ways. For instance, some people know senile pupura as purpura senilis, skin hemorrhages, or as Bateman purpura. Senile purpura was first described by British dermatologist Thomas Bateman in 1818. Just what is senile purpura? Well, the simplest senile purpura definition is when elderly are more prone to bruises. Older individuals have thinner, more fragile skin, so bruises are more likely to form as a result. In the initial stages, these bruises appear purplish red. It is common for elderly to develop senile purpura on their forearms. Purpura can also occur in the mucous membranes, particularly in the mouth and internal organs. 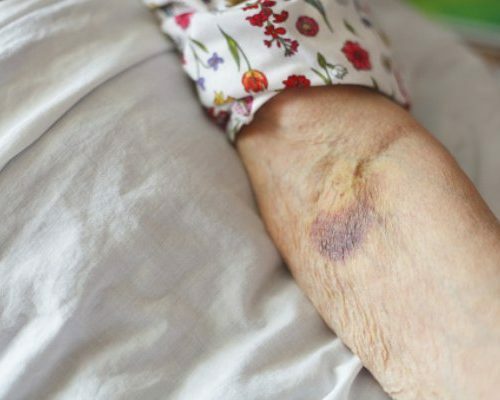 While it may appear as if a person with senile purpura has experienced a serious trauma, it is likely that some sort of mild trauma led to the development of the purplish bruises. Large purpura spots are called ecchymosis and the smaller spots are known as petchiae. Senile purpura is most common among seniors with roughly 11.9 percent of adults over the age of 50 having it. Prevalence is also highest among individuals who have greater exposure to the sun. Senile purpura is nearly exclusive to seniors with two percent of adults over the age of 60 having it and that increases to 25 percent for those over the age of 90. UV rays—ultraviolet (UV) radiation, like too much exposure to the sun, can weaken the connective tissues holding the blood vessels in the matrix. Since we are exposed to sunlight over many, many years, tissues weaken and become thinner naturally in old age. Medications—overuse of blood thinners, such as steroids and aspirin. Vascular diseases—this is a class of disease affecting the blood vessels. Thrombocytopenia—defined as deficiency of platelets in the blood, which leads to bleeding into the tissues and bruising. Non-thrombocytopenic—this includes blood clotting disorders, medications that impact platelet function, fragile blood vessels, inflammation of blood vessels, pressure changes during childbirth, haemangioma—which is a benign tumor of infancy—and amyloidosis, a disorder that occurs when amyloid protein deposits in tissues. Meningococcemia—meningococcal disease is caused by bacteria and can lead to meningitis, which is a serious illness that involves infection of the brain and spinal cord. It can also cause blood infections and a rash that can advance to purpura. Despite what some people think, the elderly don’t suddenly wake up covered in purplish red spots. There are common senile purpura symptoms that can appear before bruising. Some are covered in the list of symptoms below. Irregularly shaped lesions appear that may measure one to four cm and are dark in color. They appear on hands, forearms and sometimes the face or neck. Adjacent skin is often thin, not very elastic. One of the distinctions between senile purpura and a regular bruise is that regular bruises tend to change color. Bruises that are the result of senile purpura do not change color—they remain purple until they disappear. In some cases, a yellow of brown stain takes the place of the purple bruise for a short period of time, while in other cases, the yellowish stain is unfortunately permanent. There are people who struggle with the signs and symptoms of senile purpura. When they have just a few lesions or bruises, they attempt to cover them up with makeup. How to diagnose senile purpura? When it comes to diagnosing senile purpura, the doctor will conduct a thorough examination of the patient, including a look at their hands, legs, neck, face, and underarms. Any bruising or skin atrophy will be noted. A beam arm test is also likely. It looks at the structure and function of capillary walls. Laboratory tests such as a platelets test, capillary fragility tests, and hemostasis tests—which is a test that checks for blood clotting issues and platelet plugs—are possible. Senile purpura differential diagnosis is often used. This is a process of differentiating between two or more conditions that share similar symptoms. The list below covers most of the investigations involved with senile purpura differential diagnosis. Examination of urine to help rule out Henoch-Schonlein purpura, which is inflammation of the small blood vessels. ESR or CRP—erythrocyte sedimentation rate or C-reactive protein to evaluate inflammation related to potential vascular diseases. Rheumatoid arthritis, lupus, and Sjogren’s syndrome are all collagen vascular diseases that have been linked to purpura. Additionally, some people with internal malignancies, including lymphoma, multiple myeloma, and leukemia have been known to experience signs of purpura. Senile purpura doesn’t require any treatment. The lesions or bruises usually clear up on their own without causing any serious health complications. The problem with the condition is that it tends to be chronic. In other words, it recurs, and people have to live with it for the remainder of their lives. Those who find that they experience skin tearing should see a doctor for advice on how to manage the problem. More research continues, including investigations into how other supplements might impact senile purpura. In the meantime, people who suffer from the condition are encouraged to use sun protection when outdoors to prevent future breakouts and apply skin moisturizers to help protect the skin. In the majority of cases of senile purpura, treatment is not necessary, but for those who do not like the appearance of bruises, there are a few options available to them. For example, your doctor can prescribe topical retinoids, which can prevent further skin aging, thus reducing the appearance of senile purpura. On the other hand, these retinol formulas can bring with them unwanted side effects and sometimes the cons outweigh the benefits. It may also be wise to wear protective gear to prevent injury, which can lead to further bruising. If you want to avoid side effects, then there are some natural remedies you can try to reduce senile purpura. One study found that seniors who took citrus bioflavonoids twice daily had a reduction in senile purpura. An alternative study uncovered that applying epidermal growth factor to the affected area can help skin thicken and reduce lesions. Some studies have explored using vitamin K topically to reduce the appearance of bruising, but no studies have been conducted on vitamin K’s effects on senile purpura, so speak to your doctor before using this technique. Some patients may seek relief from Arnica Montana, which is derived from the Arnica plant. Arnica Montana has anti-inflammatory properties and can control bleeding which can make it effective at treating senile purpura. Arnica Montana can be taken orally or topically. It’s important that if you have senile purpura, you avoid foods and beverages that can thin the blood. It is unfortunate, but for many people, senile purpura is a condition that comes with age. The number of elderly in industrialized nations continues to increase, so the incidence of senile purpura and other age-related skin conditions is expected to rise significantly over the next few decades. Dermatologists suggest we do whatever we can to protect our skin from an early age. If and when something like senile purpura occurs, it is important to understand that you’re not alone and that you can reach out to doctors and dermatologists for guidance.